In the coming weeks, we will be starting a new series on Fridays, called “Slang of The First World War”, revealing words, sayings and names created or adopted by those in the trenches to describe aspects of what had become a very absurd “everyday life”. In light of our posts this week referencing “Blighty” and “Bomb-Proof Jobs”, it is fitting we define those here. Blighty – the origin of this word is unclear and various explanations exist. It appears to be a corruption of the Hindi word ‘bilayati’ or ‘bilaik’, meaning a foreign place or country, or from the Arabic term ‘beladi’ meaning ‘my own country’ (Pegler, Soldiers’ Songs And Slang of The Great War, p. 38). In British India during the 1800’s “Blighty” became a term of endearment for home and/or English things. This carried through to the First World War, and a number of secondary uses evolved depending on the context as a noun, verb or adjective, “such as ‘This is like real Blighty bread.’ “, “a Blighty one”, and a “Blighty bag” (Pegler, Soldiers’ Songs And Slang of The Great War, p. 39). Bomb-Proof Job – referred to any one of a myriad of support roles that men could be posted to in the rear areas, usually far from danger and consequently “bomb-proof”. Those who made a military career of “Bomb-Proof Jobs” during the First World War were usually disliked by frontline troops – they were often seen as cheats who received frequent and unwarranted leave passes, broke into and stole the men’s mail parcels, and who often received official recognition and medals “for bravery” whilst miles from danger. Blighty also came to represent any sort of homely comforts. 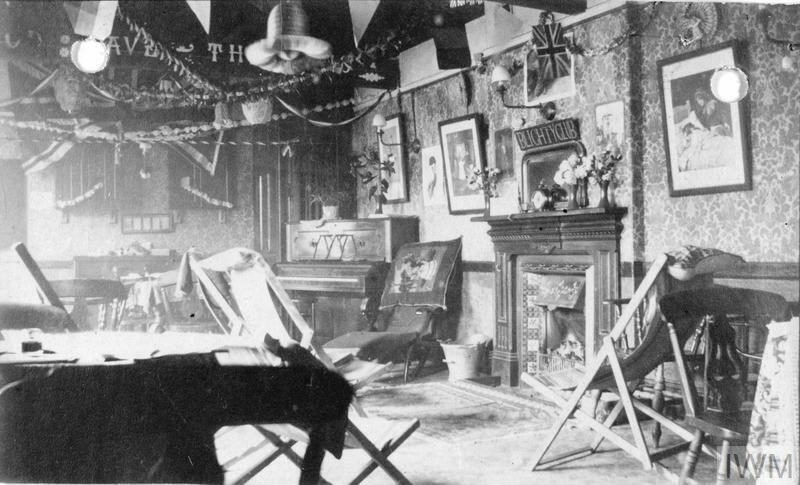 This photograph depicts the inside of The Blighty Club at Skipton in Craven, Yorkshire run by local women during the First World War. Note the “Blighty Club” sign hanging over the fireplace.